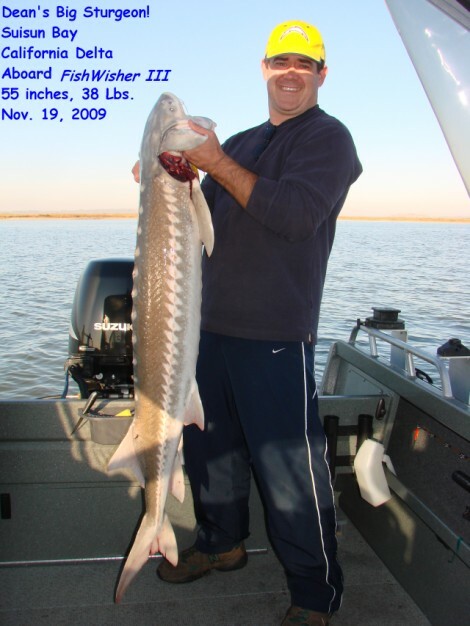 ← 2009 Fall Season: 10 Exciting Delta Trips and Willie’s First Sturgeon! Dean with his huge catch – taken during the last couple hours of fishing time during our five day visit! Nov 16, 2009, Monday, Day 1 at Delta Marina, Rio Vista, Ca. Of all the sturgeon trips of this season, this was the one I have most anticipated – my son would fly up from San Diego to spend Monday – Friday with his old man. More than anything, I wanted to get him onto his first sturgeon! I left home about 0900 and arrived at Delta Marina at 1000. This a lovely resort with berths, dock space, RV parking, store and more. (www.deltamarina.com) The resort sits on the Sacramento River in Rio Vista, and is next to The Point Restaurant, which overlooks the river. By 1100 the boat was launched and tied to the dock, the trailer parked and the coach set up in the RV space. I was ready for my son, Dean, to arrive, and he got in around 1330. It was great to be together for a few days, and while I came to fish and visit with him, he came to de-compress for a few days from his high pressure job and very, very busy life. We would both find what we came for out on the river, fishing for sturgeon and downing a few brews together. The dock and a few of the many berths at Delta Marina in Rio Vista, Ca. After sitting around the coach for an hour or so, downing a couple of beers and catching up on each other’s news, we headed to the bait shop to get his license and sturgeon tags – and another eel for bait as I was running low on bait after all this season’s fishing. After returning to the coach, we decided not to head out on the river as it was only a couple of hours or so ’til sundown. We chose to wait ’til the next day to head off on our sturgeon hunt. For dinner, we headed into Rio Vista to eat at the famous Foster’s Big Horn Restaurant. The walls of Foster’s are covered with wildlife trophies from Africa and North America including a huge elephant, several lions and many, many other critters. (www.fostersbighorn.com) We enjoyed a wonderful dinner, then headed back to the coach. By 2100 I was in bed and Dean was getting ready to turn in. The coach at rest in our RV space at Delta Marina. Tuesday dawned flat calm and clear and looked to be a perfect day for fishing. I was up before 0500, and as we agreed, I woke Dean up and gave him my bed in the bedroom so he could sleep in – a vital ingredient of “de-compressing”. He slept on the fold down couch in the living room of the coach ’til I claimed it each morning before he was ready to get up. When we were both up and around, we headed to town and had breakfast at a small Mexican restaurant where Dean could enjoy a breakfast burrito. We boarded the boat and cruised down to Decker Island and arrived a bit after 1000. We waited a bit for the tide to turn, and were finally fishing by 1030. It was a breezy day on the water, but with an incoming current and southwest breeze, the water stayed flat and the boat was stable. We tried our best to attract a sturgeon with our nasty eel, but despite five hours of trying, we had no takers. By 1600 the current had slowed to near slack and the breeze again began to swing the boat around. We gave up for the day, reeled in and headed back upriver to the dock at Delta Marina. My friend John and his son, Johnny, fished along with us a couple hundred yards upriver, but they could not attract any sturgeon action, either. They did manage to reel in a 22″ striper, so they had something to show for their efforts. Dean and the Old Man enjoy a few brews while awaiting the nibble of the mighty sturgeon. My wife, Lavonne, and her son, Craig, met us for dinner at The Point Restaurant, which is next to Delta Marina. We enjoyed a wonderful dinner overlooking the river – which we could not see since it was dark. We had a grand “family reunion” with Dean, who lives in Oceanside, and who we don’t get to visit often enough. After our warm visit, Lavonne and Craig headed back to Stockton and Dean and I headed to the coach for the night. Dean and Craig made plans to do the Napa winery tour the next day, so I’d be chasing sturgeon alone on Day 3, which I always enjoy. Since I’m down to one tag and plan to fish through November, any sturgeon I might catch would get an automatic reprieve. Dean headed to Napa Valley with Craig, his stepbrother from Stockton, while this old man headed downriver for more sturgeon fishing. But before the fishing, Dean and I headed into town for breakfast. We ate at The Striper Cafe, a small, tidy little home style eatery that was clean as a whistle and served food in gigantic portions. Dean ordered a full breakfast and couldn’t finish it all. I ordered just toast, and nibbled a bit at Dean’s leftovers. I wish there was a Striper Cafe in my hometown! the effects of the wind. As time went by and the current increased, things settled down very well and the boat stayed put in line with the river’s flow. It was a choppy afternoon near Decker Island. My continuing efforts to catch a sturgeon went unrewarded. I freshened the bait with the new eel we bought, and even that didn’t help. Another skunk meant two days in a row with no sturgeon action – and that was hard to accept in light of the great results I’ve had at Decker Island this season. I decided that the answer was to head to Suisun Bay for our try the next day. I was feeling pretty whipped after two days just sitting in the boat. I continued my sturgeon quest all afternoon, much of the time seeking refuge from the cold wind by sitting on the helm seat, deep inside the canvas cabin – and even fired up the heater about mid-afternoon. I fished the entire incoming current ’til once again the wind overpowered the decreasing current as high tide approached. The wind calmed considerably late in the afternoon, and conditions were much improved. At 1600, as the current slowed and the boat again began to swing from the effects of the breeze, I reeled in, raised anchor and headed back to Delta Marina’s dock. It was cool and I hid deep in the canvas cabin to stay out of the wind. Hopefully the wind would be calm on Thursday and we’d be able to cruise the 25 miles downriver to Suisun Bay to give my favorite sturgeon hole a try. We began this day’s adventure with a drive into town and the Striper Cafe where we both ordered pig-out portions of pancakes, eggs and sausage – and a side of hash browns! On second thought, I’m glad there isn’t a Striper Cafe near home – I’d weigh 300 pounds! This would be our last day to try for a mighty sturgeon, and the weather was absolutely perfect for a run downriver to Suisun Bay and my favorite sturgeon honey hole. On average, I score a sturgeon 50% of the time there. I was skunked my last visit to Suisun, and we’d just had two skunky days in a row near Decker Island, so it was time for some sturgeon action. The weather certainly was on our side as I’ve never seen the river any calmer as we cruised down to Suisun Bay and my honey hole. Suisun Bay calm as glass – this is rare and a good omen of things to come! We dropped anchor at 1030, just as slack tide was changing to an incoming current. I cut fresh steaks off the new eel, stuck them onto both hooks of each leader, and cast our offerings into the brackish waters of Suisun Bay. The sun was bright, the water flat calm and the air was cold. It was a wonderful autumn day and getting Dean onto his first sturgeon would make this the perfect day. Time passed gloriously and slowly as my son and I soaked in the sunshine and talked of times past. Sometime after noon, Dean reeled in a scrappy 19″ striper that tried to steal one of our eel steaks. As he reeled him to the side of the boat, I retrieved him and we had a photo op – albeit not much of one. We tossed back the little striper, and continued our patient wait for a hungry sturgeon. Time was winding down, and we were aware that our last day for catching Dean’s first sturgeon was slipping away. The little striper was returned to fight another day. At about 1435, something tapped one of our lines, and then there was that classic sturgeon pull of a few inches of line from the reel. I shouted at Dean “this is a sturgeon” as we reeled in the other line and cleared the deck for the coming fight. The sturgeon we had on was a fierce fighter, and he immediately breached, giving us the thrill of seeing our fish thrash high in the air. He then came charging at the boat, the line slackening as he did so! “Reel fast!” I shouted to Dean, and the next thing we saw was another airborne show, this time just a couple of feet from the outboard motor! And then whizzzzzzzz! – off he went, hell-bent for anywhere but the boat! The reel hummed as the mighty sturgeon took line against a hard drag that gave up line as if in free spool. He soon tired after that mad dash, and when he tried to rest, Dean worked him to the boat. All too soon he was alongside the boat, belly up and completely exhausted. I set my little plastic measuring tape alongside him in the water, and he measured smack in the middle of the slot. We netted him, administered a couple of righteous whacks, tied him to a dock line, then bled him as he laid in the cold water. Whew… We were spent, too! He had put up a short but fierce battle, and Dean had experienced the thrill of battling a big ol’ sturgeon! We finally welcomed him aboard, placing him in the motor well. He measured 55 inches and weighed in at 38 pounds. We had finally caught Dean’s big sturgeon – in the final two hours of our delta adventure! The monster that made our week complete! We basked in the excitement of the moment, and almost instantly there were photos of Dean holding his beastly fish on Facebook and several emails as we sent the photo over both our phones. This great moment was known throughout the land even before we fired up the motor to head home! The modern gizmos we now take for granted make for instant and far-flung bragging rights! Incidentally, our sturgeon was tagged; we found a dime size tag wired to his back. We cleaned the accumulation of marine growth from it and saw that it was a $20 reward tag by California’s DFG. It is coded so that when DFG gets the tag, they can tell us some of that sturgeon’s history. When I get that information, I will add it to this story. Upon our return to the dock, we bought some ice, brought down the big ice chest from the coach and stored the big fish on ice. A couple of gals from the Delta Marina store came out to admire our catch. I then called my buddy Willie, and he drove over from Stockton to take the fish home. Dean and I retired to the coach to kick back with a couple of Tom Collins cocktails. After showering and resting a bit, we walked over to The Point Restaurant and enjoyed our last dinner of this great vacation. This was a grand time for us to spend together, something we don’t often get to do, and that big ol’ sturgeon made this an unforgettable adventure. I look forward to many more! Dean helped retrieve the boat Friday morning as our week came to an end. It was time to head back to real life. This entry was posted in Fishin' with M'Boy!, Fishing + RVing = Comfort, Fishing Sturgeon. Bookmark the permalink.